Be careful not to damage wheel sensor edge and sensor rotor teeth. When removing the front or rear wheel hub, first remove the wheel sensor from the wheel hub. Failure to do so may result in damage to the wheel sensor wires, making the sensor inoperative. Pull out the wheel sensor, being careful to turn it as little as possible. Do not pull on the wheel sensor harness. Before installation, check if foreign objects such as iron fragments are adhered to the pick-up part of the sensor or to the inside of the hole in the wheel hub for the wheel sensor, or if a foreign object is caught in the surface of the mating surface for the sensor rotor. Clean as necessary and then install the wheel sensor. Remove the front wheels and tires using power tool. Refer to WT-47, "Adjustment". Remove the fender protector (front). Refer to EXT-28, "FENDER PROTECTOR : Removal and Installation - Front Fender Protector". Disconnect front wheel sensor harness connector. Disconnect front wheel sensor harness from brackets. Remove front wheel sensor bolt. During installation, make sure there is no foreign material such as iron chips on and in the mounting hole of the wheel sensor. Make sure no foreign material has been caught in the sensor rotor. Remove and foreign material and clean the mount. 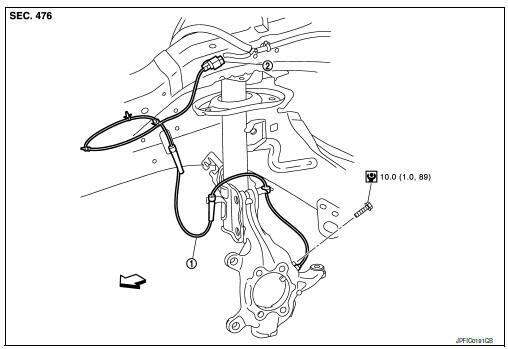 Do not twist front wheel sensor harness when installing front wheel sensor. Check that grommet (2) is fully inserted to bracket (1). Check that front wheel sensor harness is not twisted after installation. Remove rear wheel sensor harness connector. Remove rear wheel sensor bolt. 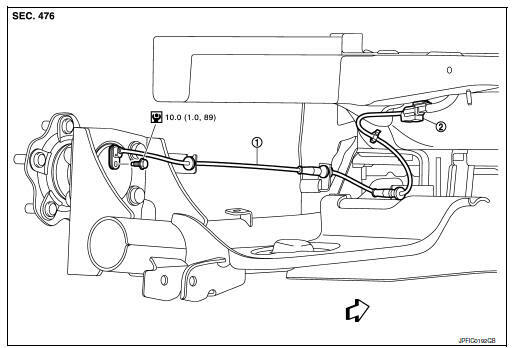 Remove rear wheel sensor harness from the brackets.